Lesley Riley, also known as ‘Mama Biscuit’, has perfected the buttermilk biscuit and will now be bringing her gourmet biscuits to Walmart shelves at 55 stores in 9 states starting October 8th. This women and minority-owned business based in Frederick, MD is just three years old and was one of the 500 companies and 750 products invited to attend Walmart’s Open-Call event in June 2017. In 2013, Walmart pledged to purchase approximately $250 billion in products supporting American jobs by 2023. The Open Call event, held every June, is one way the company supports this effort. At each daylong event, Walmart buyers choose from hundreds of local entrepreneurs, giving them an opportunity to develop their businesses further and possibly onto store shelves. 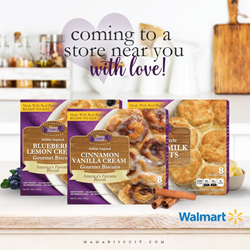 Mama Biscuits will offer two flavors in Walmart stores: Cinnamon Vanilla Cream and Blueberry Lemon Cream. As the nation’s sole Gourmet Biscuit Company, Riley hopes to continue expanding into more Walmart stores across the country. Mama Biscuits is also available at Sam’s Clubs throughout the Mid-Atlantic region. Walmart Inc. (NYSE: WMT) helps people around the world save money and live better - anytime and anywhere - in retail stores, online, and through their mobile devices. Each week, over 260 million customers and members visit our more than 11,600 stores under nearly 60 banners in 28 countries and eCommerce websites. In Maryland, we serve customers at 60 retail units and online through Walmart Grocery Pickup, Walmart.com and Jet.com. We are proud to employ 18,554 associates in Maryland. Walmart supports local businesses, spending $ 1.2 billion with Maryland suppliers in FY18, which supported 34,837 supplier jobs. Learn more at the Walmart Today blog, and our Facebook, Twitter, Pinterest, Instagram channels. Mama Biscuit’s is located in Frederick, Maryland is currently located in 200 stores on the East Coast but ships nationwide through their e-commerce shop. The shop offers more than 50 unique flavor combinations of both sweet and savory on a rotating basis and all flavors can be made in a gluten-free version. Some of their top selling flavors include Bananas Foster w/Salted Caramel Pecan-Praline, Chicken Pot Pie and Kahlua Stuffed Brie. For more information on Mama Biscuit’s Gourmet Biscuits, visit MamaBiscuit.com.